Now that we’ve discussed what kind of link building tactics are and are not good for your rankings, it’s time to begin. Creating a link building campaign consists of much more than publishing quality content and hoping for the best. No, link building involves strategy. First and foremost, you must set goals. Link building is a part of your overall content marketing campaign, and as such, deserves the same level of attention and care that you would show to designing and developing a website, producing content, and deciding how, when, and where to publish that content. And, like with your overall content marketing campaign, you need goals to get your link building campaign going in the right direction. However, setting goals isn’t as simple as saying, “I want to obtain 10 links in the month of March.” You need to make sure that your link building goals are in line with your overall business objectives. If obtaining 10 links does not have any impact on the overall success of your business, should you really spend the resources to obtain those links? Probably not. So, what kinds of goals are reasonable goals? No, we don’t mean aim for short-term success—we mean set milestones for which to measure your link building campaign’s overall success by. Saying that you want to obtain 10 links next month is unrealistic and only sets you up for failure. As we stated (countless times, we’re sure), link building takes time and patience. Your goals should reflect that. For instance, though the overall goal of your campaign is to boost your rankings so you can drive more traffic so you can gain more business, you cannot expect to see links overnight. In fact, it may take several months to a year to see any results. This is especially true in saturated industries. In order to avoid becoming discouraged (and in order to show CEOs and shareholders that your efforts are, in fact, making a positive impact), set milestone goals. Instead of setting an overreaching goal of, “Obtain x amount of links,” aim to drive more organic search traffic so that you can make more sales. This is not only in line with overall business objectives, but also, it’s realistic, and a goal that can be measured. While you should never not be creating new and unique content, when you first start out on your link building endeavor, you may be hard pressed to come up with relevant and engaging content. Moreover, you need to find your “hook”—that “thing” that will make people care about what you have to offer and entice them to link to you. A great place to start looking for that hook is your content archives. Existing assets—whether they be old content, data, offerings, or people—are a treasure trove of content ideas. For instance, you may find some great direct mail pieces that boast an old slogan that acts as a great title to a blog article. Or you may find that your employees have invaluable insight that you, being too close to the company, hadn’t considered before. Customers serve as great resources as well, as they probably have a ton of questions about your product or service offerings that you can answer in an FAQ style white paper. If you have a product or service and a customer base, you have assets. Recognize the potential in them and use it to create the useful and informative content your audience has been waiting for. When building your links, you can also combine the above. For instance, a link containing your brand name can link directly to your home page, and a link containing a popular keyword may link to your products/service page. When determining what types of links will garner the most success, perform a detailed link analysis of your current website as well as how you rank for certain keywords in comparison to your competitors. Your analysis should point to opportunities for improvement. For instance, if you’re not ranking for a certain industry keyword but the rest of your competitors are, you may find that you have no links pointing to your website that contain this keyword. Additionally, you may find that your homepage, or a relevant deep page, has no links pointing to it at all. Resolving issues like this are a great place to start your link building campaign, as they are pressing issues that significantly affect the overall rankings of your website. Once you have a rough idea of how you want to approach your campaign, it’s time to identify people who might be interested in your particular content. You do not want to contact people at random (or people you know but who are in an entirely irrelevant industry to yours), as doing so can hurt yours and your website’s reputations. With that in mind, think carefully about who would care about what you’re doing. For instance, if you’re in the business of manufacturing dental equipment, reaching out to a friend in the marketing sector isn’t going to do you any good. Nor, in fact, will reaching out to dentists, as they aren’t in the business of selling dental equipment—they’re in the business of using it. Your target audience is likely to be publications that dentists read, such as Dentistry Today, Dental IQ, the Journal of Dentistry, or the Academy of General Dentistry. With your link targets in mind, consider the types of content they would care to link to. Would they be interested in an infographic? A long-form article? A product page? This is the point at which your campaign really starts to take shape, so it is imperative that you correctly identify your link targets and their ideal links. It cannot be stressed enough: the content that you produce must be good enough for your link targets to not only like, but also, to engage with. Linking to something requires time, effort, and faith on the linker’s part, as they must look for relevant information, determine whether or not it is credible, and then hope, after the fact, that it is and that the page they linked to wasn’t some spam page. So how do you go about creating content that makes people care enough to link to it? Again, it’s all about that hook. You need to identify your hook before you publish any content, as doing so allows you to test your hook and determine if it is strong enough. You would be much better off finding out that your hook is garbage after producing three to four pieces of content than if you were to spend time creating 50 pieces of content, then identifying your hook, and then realizing your hook is no good. There are so many different angles you can use to approach your content; it is up to you to identify your link targets’ style and build off of that to create content they would be willing to vouch for. One way to go about finding worthy links is to scroll through your social media activity logs to see what people are sharing and linking to and look for patterns. Are people routinely sharing funny content? Industry news? Your free eBook? Chances are that what is getting shared most is also what will earn the most links. Though we touched on it briefly in the above section, we’ll now explain in detail how to build a list of potential website owners and bloggers that might actually link to your content. A large part of this step involves using your common sense. Let’s look at an example. Imagine you’re putting together a guide titled, “Link Building 101.” You are producing this content because you sell SEO and content creation services. Who might be your target audience? Website Developers: They may want to team up with you in building a client’s website. 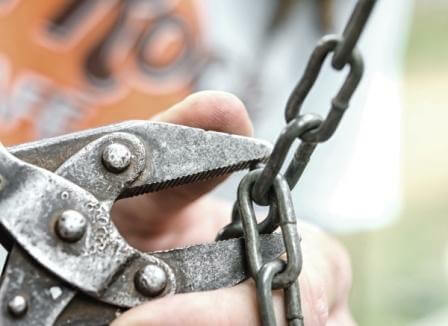 Business Owners: They may want to take the DIY approach to link building and need an extensive guide to teach them how. Business Development Services: They want to provide their clients with the tools they need to succeed, and your guide may be one of them. Other SEOs: They want to stress the importance of link building too, after all. In just a few short minutes, we were able to think of four target markets for your link building guide. Now it’s time to start researching actual organizations that may be interested in sharing your guide with their audiences. But how do you do that? Start by creating a list of websites for each market you identified that might benefit from your services. Use Google, Scraper (a Chrome plugin), social media, and advanced search queries to identify websites that might have a need for content likes yours. Once you have your list, take the time to scroll through each website to make sure that they have a need for content like yours. Pay close attention to whether or not they are in the habit of sharing other websites’ content, or if they strictly include internal links. Websites that aren’t in the habit of linking to outside sources probably won’t start doing so with you. Contacting link targets is time consuming and tedious work, so in order to streamline the process, categorize them. There are few ways that you can do this. By Influence: Number of social media followers, blog comments, etc. While each of these categories is important, your top priority should be those that are most likely to link to you. Unfortunately, there is no tool to determine how likely a target is to link to your content, so you’re going to have to go old-school to determine this, with the rating system. One of the simplest ways of determining whether or not a target is worth contacting is to scroll through their website and assign a rating (1-5) for certain factors, with 1 being not likely to link based on x factor, and 5 being the most likely to link based on x. Is their content relevant to mind? Are they actively posting new content? How often do they share other websites’ content on social media? Websites that rank the highest should be your priority contacts. Create customized messages that are tailored to them and their offerings for the highest chance of gaining a link. As you work your way down the list to the least likely to give you a link, you can be a little more generic with your message. However, don’t be too generic, or you’ll come off as just another spam website owner looking for an easy way to the top.